In the recent years, European lofts have been given New-York lofts quite a run for their money. The last family loft featured here was hugely inspiring, packed with beautiful details and an amazing chandelier from Anthropologie. Today, I’m taking you to Eindhoven to visit Jason’s beautiful loft. An amazing 87 sqm loft space with 4.60 m high walls which proved to be a bit challenging to paint. The things I love the most in this place is the contrast between the rough concrete wall and the pristine white walls and of course the high ceilings and natural light filling up the place. ✔ The vintage Jieldé Loft floor lamp (foreground) and the Spot lamp (background) are from Jason’s shop Craft Industry. New Jieldé lamps can be found at Clippings. I’m always drawn to places with high ceilings as they provide great luminosity and a great sense of space (shutters or blinds are a must for those who can not sleep with so much natural light). However, sometimes even such an amazing space can also feel a bit empty so here are a few tricks to humanise the space. ✔ Fill in the space created by high ceiling by hanging big pendant lights. The Bell lamp by Normann Copenhagen is absolutely massive. I saw several of them hanging in Normann’s flagship store during my last trip to Copenhagen and they really look amazing, with the added value of being lighter to hang than an industrial, vintage pendant light. You can see it here hanging in a similar loft. ✔ Create corners to give your space some kind of structure. In Jason’s loft, everything flows nicely together with corners and wall spaces clearly allocated to the lounge, dining and home office. ✔ Display feel-good family photos and great black & white art prints on a wall (like the mood board I created in our lounge). ✔ And add textures…with a few linen pillow cases, a throw to curl up on the sofa or rugs. John Lewis has a good selection of large, plain, textured rugs that would look great on floorboards or concrete floors. Mixing chairs’ shapes and styles create a relax, boho feel. This goes for white interiors too. In our holiday home in France, I sourced a bunch of vintage, second-hand chairs and painted them all in white (see my Pinterest board here). It is also a great way to collect all the different designs you love and mix a Tolix chair with a Bertoia Diamond chair (on my wishlist) and a few industrial metal stools. Play with contrast to accentuate the original features of your home or furniture. In our home in London, I displayed off-white ceramics on a vintage shelf sourced from Castle Gibson in Islington. In our showroom, we displayed beautiful, black ebony ceramics on this industrial shelving unit. ✔ All the furniture and industrial lighting in the loft have been sourced and renovated by Jason. Similar pieces are available from his shop Craft industry . ✔ The new Rankin collection from MADE is pretty cool and this 5-drawer metal filing cabinet and industrial storage rack fit the bill right up. For dining, my favourite ‘industrial’ tables are the Form table and the one from Vipp. I kept my favourite detail for the end…the kitchen cupboard! Jason’s loft is truly amazing but not everyone has the chance to live in such a great, airy space. However, his kitchen and mostly this striking, beautiful kitchen cupboard is something that we can all achieve in a traditional house. 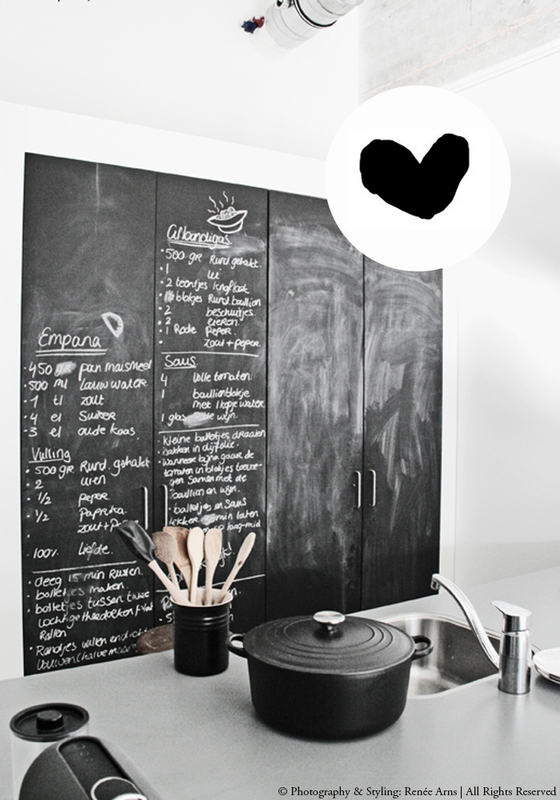 The floor-standing kitchen cupboards were there when Jason moved in but he painted the front with blackboard paint and wrote all his favourite recipes which adds a striking corner to the kitchen area and he is now considering replacing the worktop by a wooden one. ✔ You can get the cast iron Le Creuset casserole from John Lewis. Frankly, a must-have! They last forever and I have a recipe of Boeuf Bourguignon to die for if you want it. ✔ Ikea sells similar kitchen units and the appliances are from SMEG which is the ones I’m looking at using when renovating our kitchen. What do you think? Do you love this home? Beautiful loft, I like the industrial look. Oooh and the idea of the recipes is gorgeous ! Yes it is and it’s a rental place :-) wouldn’t it be amazing to live in it ! ?